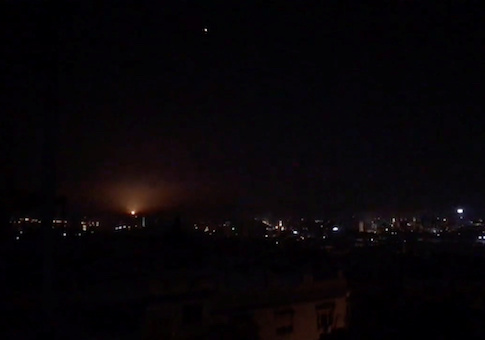 BEIRUT/JERUSALEM (Reuters) – Israel struck in Syria early on Monday, the latest salvo in its increasingly open assault on Iran's presence there, shaking the night sky over Damascus with an hour of loud explosions in a second consecutive night of military action. The threat of direct confrontation between arch-enemies Israel and Iran has long simmered in Syria, where the Iranian military built a presence early in the nearly eight year civil war to help President Bashar al-Assad's government. Israel, regarding Iran as its biggest threat, has repeatedly attacked Iranian targets in Syria and those of allied militia, including Lebanon's Hezbollah. With an election approaching, Israel's government has begun discussing its strikes more openly, and has also taken a tougher stance towards Hezbollah on the border with Lebanon. It said a rocket attack on Sunday was Iran's work. The Israeli shift comes a month after U.S. President Donald Trump unexpectedly announced a sudden plan to pull the 2,000 U.S. troops from Syria, a move long sought by Assad and his Russian and Iranian allies. Trump's decision shocked American allies in the region and was opposed by top U.S. officials including Defense Secretary Jim Mattis who quit in response. The Israeli military said its fighter jets had attacked Iranian "Quds Force" targets early on Monday, including munition stores, a position in the Damascus International Airport, an intelligence site and a military training camp. Its jets then targeted Syrian defense batteries after coming under fire. Syria said it was Israel that had attacked and its air defenses had repelled the assault. Syria had endured "intense attack through consecutive waves of guided missiles", but had destroyed most "hostile targets", state media quoted a military source as saying. Assad has said Iranian forces are welcome to stay in Syria after years of military victories that have brought most of the country back under his control. Just two big enclaves are still outside Assad's grip, including the area Trump plans to exit. Netanyahu, who is hoping to win a fifth term in the April 9 election, last week told his cabinet Israel has carried out "hundreds" of attacks over recent years. Tensions have also risen with Israel's construction of a frontier barrier that Lebanon says passes through its territory. Washington has sought to reassure allies it still aims to eject Iran from Syria despite pulling its own troops out. U.S. Secretary of State Mike Pompeo, who visited the region this month, has vowed to expel "every last Iranian boot" from Syria. Israel has sought reassurances from Moscow that Iranian forces in Syria would not be a threat. Israeli military spokesman Lieutenant Colonel Jonathan Conricus said the missile fired at the ski resort was launched from "an area we were promised the Iranians would not be present in".